We’d love your help. Let us know what’s wrong with this preview of Knocking on Heaven's Door by David Crump. How are we to understand petitionary prayer? This is a key question for any thoughtful believer who desires to take both the Bible and experience seriously. Some believe God answers any prayer as long as the one praying has enough faith and/or persistence. Others conclude from experience that prayer is really for our benefit and has no impact on God's actions. According to How are we to understand petitionary prayer? This is a key question for any thoughtful believer who desires to take both the Bible and experience seriously. Some believe God answers any prayer as long as the one praying has enough faith and/or persistence. Others conclude from experience that prayer is really for our benefit and has no impact on God's actions. According to David Crump, both views are extreme and potentially harmful. To ask other readers questions about Knocking on Heaven's Door, please sign up. An examination of the entire New Testament to craft a comprehensive theology of intercessory prayer. Crump is a careful expositor and also a man of opinion (reasonable and well-supported, though at a few points around liturgy/repetition and the Jesus prayer he did raise my hackles a little) and he is quick to brush aside false and/or popular misconceptions. He examines the practices and parables of Jesus (through the gospel writers, Luke bringing prayer to the forefront), Paul and the other NT w An examination of the entire New Testament to craft a comprehensive theology of intercessory prayer. Crump is a careful expositor and also a man of opinion (reasonable and well-supported, though at a few points around liturgy/repetition and the Jesus prayer he did raise my hackles a little) and he is quick to brush aside false and/or popular misconceptions. He examines the practices and parables of Jesus (through the gospel writers, Luke bringing prayer to the forefront), Paul and the other NT writers, and thus emphasizes the centrality of intercessory prayer in the life of the Christian and the Christian community. In doing so he does dismantle much folktale and superstition about repetition, about formula (in Jesus's name). He is less impatient than me with those who too often intone "if it be your will," but he is Biblically focused on the necessity and role of prayer as cooperation with God's work. We do not just pray to change ourselves or to submit to the inevitability of the divine will as in some versions of Calvinism. A scholarly and challenging treatment of prayer in the New Testament. Not light reading, but very rewarding. Crump is a first-rate biblical scholar. This is the first time I've run into David Crump and I have to say that that his work was well worth the read. 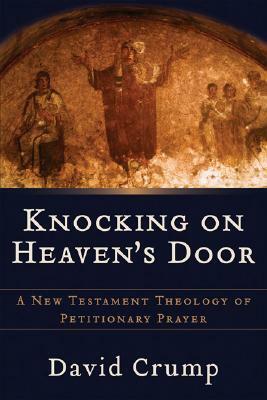 This book deals with the subject of petitionary prayer from a theological perspective. The author looks at how prayer is described in various parts of the New Testament, and he explains the theology behind it. The book is very interesting, but it is also very dense. I learned a lot from reading it, but it was not exactly an easy read. Excellent! Crump clears away many misconceptions about prayer. He has given me new hope to continue my conversations with God.